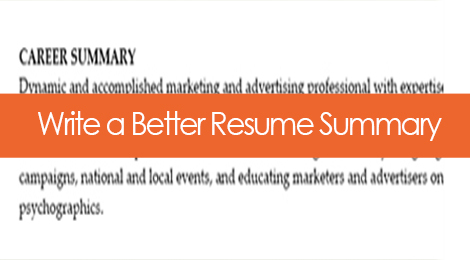 The resume summary statement is a powerful selling tool that can make or break the document. It’s a job seeker’s prime real estate, and it’s all about highlighting your skills, strengths, experiences & core competencies that will best position you as a qualified candidate for the role. It’s also the first thing your audience will read on your resume, and it can set a powerfully branded overtone for the rest of your document. For resume summary examples, click here. If you don’t want them to miss your message, then I say, lay it out for them – clearly and concisely. Writing about yourself can be a difficult feat, a brain-cramping exercise confusing to even the most creative and linguistically-gifted folks! So I’ve broken it down for you into a few easy steps to get you going. STEP 1: Start by determining your main message. STEP 6: Modify as needed. I recommend tailoring this for each resume you send out so that you are appealing directly to the exact role and company to which you are applying, as the most important skills and attributes may vary. Bonus: You can also use this for your LinkedIn profile or other social media profiles. Your branding summary statement is a marketing tool, and when used effectively it should communicate your brand in a way that screams, “Hire me! I’m qualified and full of the potential that your company needs, dammit.” Well, something along those lines. This is just the beginning. Download the full Resume Summary Statement Worksheet for additional prompts and step-by-step ideas to inspire your best writing and ensure you’re truly communicating your value in the right words. Tags: career, communication, job search, personal branding, resume summary, resumes. Bookmark the permalink. Is Your Job Title Killing Your Job Search?